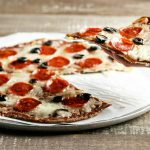 My Low Carb Thin Crust Pizza is a yummy, gluten free, low carb, keto pizza that has a thin, slightly crisp, but sturdy crust. 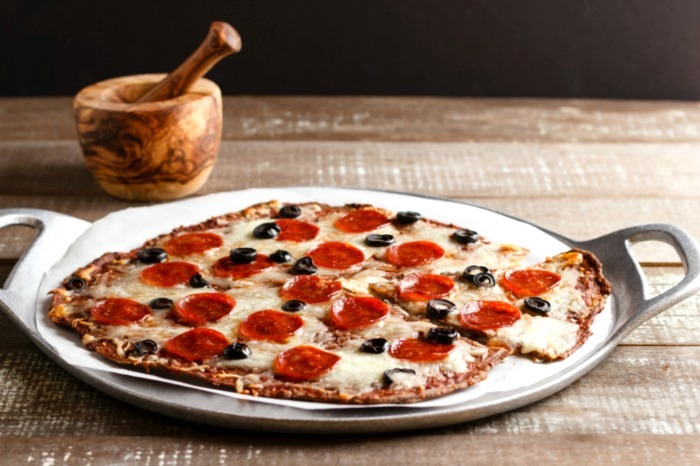 This Low Carb Thin Crust Pizza has been a couple years in the making. I’m so excited because I finally made a low carb pizza dough crust that has a similar texture and taste to the real thing! After many failed pizza dough experiments, finally, I made a veggie free crust that is low carb and much like the kind at a pizzeria. 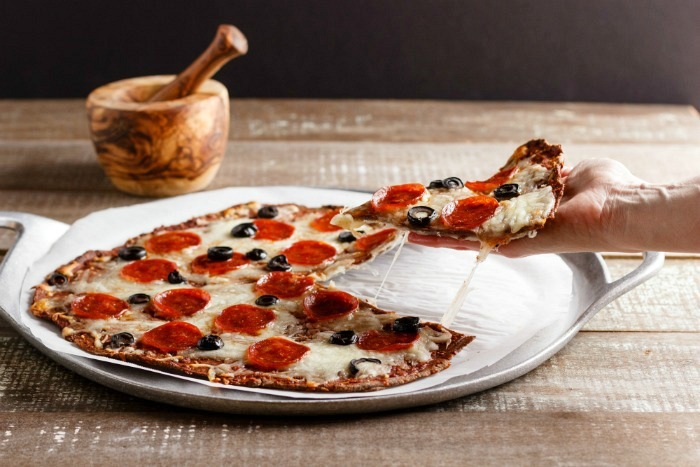 It can be made into a thin crust that is crisp but will hold toppings. I sort of combined the best of almond flour crusts, fathead crusts, cheese crusts, and psyllium husk crusts into one amazing pizza dough crust that has made me extremely happy! Now I can have a low carb pizza that tastes like a real pizza! Even my kids thought it was good. Don’t you just love stretchy cheese?? Preheat oven to 425 F ( 218 C). In a large mixing bowl combine: ⅔ cup almond flour and 2 tbsp psyllium husk powder. Mix together and set aside. In a medium mixing bowl combine: 1 egg, 2 tbsp cream cheese softened, 2 tbsp egg whites (or 1 separated egg white), and ½ cup grated mozzarella cheese. Mix together thoroughly. Add wet ingredients to dry ingredients and mix together well. Place the dough between two large sheets of parchment paper. Using a rolling pin, roll into a thin round crust. Place crust between 2 sheets parchment paper on a large baking sheet or pizza pan. Peel off top sheet of parchment paper. Bake for 10 minutes. Remove from oven. Flip over crust on to pan and peel off the other sheet of parchment paper. Return to oven and bake for 10 more minutes. 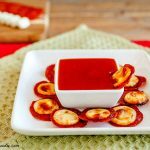 In a bowl combine all the pizza sauce ingredients and mix. Remove pizza from oven and spread sauce over crust. Top with cheese, pepperoni, and optional olives. Bake once more for 5 minutes or until cheese is melted. Serve. 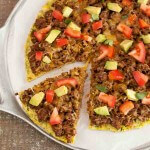 Nutritional Data: Yield 7 slices, Serving Size: 1 slice out of 7, Cal: 221, Carbs: 7 g, Net Carbs: 5 g, Fiber: 2 g, Fat: 17 g, Saturated Fat: 5 g, Protein: 10 g, Sugars: 1 g.
A thin crust pizza dough that is low carb & gluten free. The taste and texture of real pizzeria pizza. 4 g net carbs per medium slice. Pizza has always been my biggest temptation. 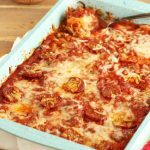 It’s so nice to have an easy low carb pizza recipe. Thanks! I will take a slice of this! It looks delicious. Thanks for sharing. This looks great! So good to know that you can have pizza and it’s still low carb! This crust looks so delicious! And, it’s full of protein! I feel like I can smell it through that video, yum! I love a crispy thin crust pizza every now and then… now with your low-carb recipe, I might be able to enjoy it more often. Thank you! Oh my goodness, that melting stretchy cheese!! 🙂 🙂 We love pizza, can’t wait to make!! I definitely need to try this out, looks perfect! I always prefer thin crust pizza or flatbread over thick crust so this looks perfect!! and…I love the name of your blog! so fun! Now I’m craving pizza… This looks delicious! Thin crust pizza is my weakness and this looks amazing! I’m drooling just from the photos. My husband and I love making healthy pizzas at home and this one looks amazing! Having the recipe video is very helpful, thank you! This is the best low-carb pizza base recipe on the web. I’ve made it half a dozen times already. Not only is it pretty fool-proof, it’s super tasty and easy to customise. I love it! Thank you Stacey. That looks incredible! Just what I was looking for. Thank you so much, Becca. Not weird at all. I must have some kind of food OCD for sure, lol. I just made this pizza and I am thrilled! In my oven I didn’t need 10 minutes cooking time per side but I will reduce in increments until I find the exactly perfect time. Great recipe. Thank you so much, Caron. Yes, all ovens are a little different. So thrilled you enjoyed it. Barbara, thank you for trying the recipe! What is the purpose of the husk powder ? Will this work without it ? Hi Teri, Psyllium husk powder is a soluble fiber from psyllium seed husks and it adds fiber and binds the dough together better: http://amzn.to/2uOj0Ig. You can substitute it with golden flax meal if you prefer. Thanks for posting the substitution for psyllium husks (as I get pains when I try to use it ) and now am hopeful I can make this! No worries, it can be too much fiber for some people. I just made this for lunch, and omg! It’s absolutely delicious. I love a crunchy thin crust. I am so happy I found your website. Everything I have tried so far has been wonderful. Thank you! Question: Do you think 2 tbsp of natural yoghurt would work as well as cream cheese in the crust? Lisa, I’m not sure that would work out. 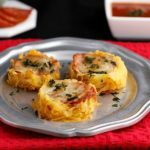 GREAT RECIPE!, I JUST LOVE YOUR RECIPES!, BUT LATELY I HAVEN’T BEEN GETTING YOUR NEWSLETTER LATELY; LOVE TO GET NEW RECIPES!. Hi Kelly. Thank you. I’m getting the newsletter out tomorrow. Just a little behind this month on my emails. Can I substitute flaxseed powder for psyllium husk powder? I’m limited to what I can eat due to diabetesII. Diane, flaxseed meal would work in this as well for a psyllium husk powder substitute. Yumm! This looks absolutely delicious I want to try this soon. This looks like my perfect Friday night, and that cheese pull is making me hungry first thing after breakfast this morning! MUST TRY. This looks like the ultimate thin-crust, cheesy, pepperoni-loaded goodness! OMG! This looks so good! You are making me hungry!! This crust looks amazing! I definitely want to try it. This pizza crust looks amazing! I can’t wait to test it out on my pizza-lovin’ family! This pizza looks amazing and that crust looks perfect! Yum! Stacey ! This thin crust pizza is driving me nuts !! I want it so much. Thanks for the wonderful recipe !! Real talk, why are there 7 servings? Who cuts a pizza into 7 slices? There are supposed to be 8 slices, but I like my slices a little bigger, so I did 7. This looks so good – totally drooling over here. And what’s a pizza without that stretchy cheese. Thank you Anya 🙂 Mozzarella is the stretchiest cheese! Oh my gosh this looks insanely good!! I need this for my next pizza night! Mmmmm…. I’m not a huge pizza fan but this crust sounds delicious! Oh man this looks so good. Do you think there is a dairy free alternative for the crust? Maybe cashew cream? I would love to try this! Thanks! Cashew cream might work, not sure. We try not to have cheese much since dairy doesn’t agree with us but sometimes we make an exception to make a good pizza. This looks like an exception-worthy one to try! Yes please! I have been craving pizza and watching my family eat gluten free pizza that I couldn’t have. I can’t wait to make this soon. Such a great pizza night change up! Thanks for the easy to follow video! Would there be an alternative to almond flour? Family members are allergic to almonds but I’d love a good low carb pizza crust!!! Shae, you can replace the almond flour with 1/3 cup coconut flour. 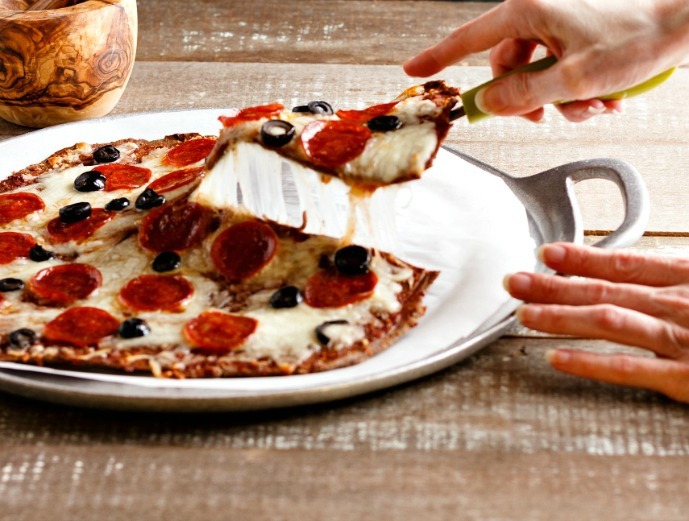 I’ve always preferred thin crust over thick crust anyways, so I’m totally eyeing up this low-carb masterpiece! I can taste and smell it from here! Thank you Bethany! I love thin crust, but won’t say no to thick crust, lol.